It’s Christmas time for us Wizards. The fall set always brings with it a crackling excitement of new spoilers each day to be dissected at FNM and on Twitter, with thousands of players trying to break the card in each available format. Many stay up until midnight eastern to see the new spoilers that hit from non-WotC sites, and those of us at work at 11am each morning are F5ing DailyMTG for the official spoilers. It’s hard not to be swept up in the collective thrill of the community. I suppose a more appropriate metaphor would be Hanukkah, right? We don’t have a single night of hundreds of spoilers, but rather, a little bit doled out each night. We even have a Candelabra. That sounds more accurate than Christmas, really. This weekend was Pax, and they lit a big ol’ present candle at the Magic party they have there every year. (Annual reminder: Don’t go to Pax.) A bunch of cards were spoiled, including a ridiculous Jeskai Khan, a legitimate-looking Sarkhan Planeswalker, and, the subject of today’s article, the Onslaught fetches. Let me begin by saying I’m sorry. I’ve been spending months talking about how I didn’t think the fetches would be in Khans. If you got burned on this reprint because of my advice, I really do apologize. If it makes you feel any better I’ve got a bunch of Zendikar fetches in my possession, so I’m getting gotten by this just the same. The decision still seems odd to me, honestly. There’s no mechanic to really support their presence. Sure they work with delve, but what doesn’t work with delve. As long as you’re playing Magic, you’re fueling delve. Morph doesn’t care about fetching. Prowess and raid and outlast don’t. They even chose what feels like the wrong fetches. This block is all about wedges – RUG, UWR, etc. With the allied fetches, for RUG we only get RG. If we got the enemy fetches we would get both UR and UG. Basically what I’m saying is that they really seem shoehorned in. I’m guessing they weren’t originally planned for the block, but Wizards made the decision sometime possibly late in design or in development that they needed to put fetches in. It was brought to my attention that apparently the fetches were the first cards in the set. This doesn’t change the fact that they feel out of place. I’m guessing they make more sense once we get to the end of Louie. Regardless, this is the world we live in. The Onslaught allied fetches are on their way and we need to decide what this means for our existing Onslaught copies, as well as what’s going to happen with the Zendikar fetches. Lucky for us there is some precedent for expensive old cards being reprinted in Standard. We don’t have to turn our gaze past Standard to see both Thoughtseize and the Shocklands. Let’s check out the Lorwyn printing of Thoughtseize. The red strips indicate Modern PTQ seasons. According to Wikipedia Modern was announced back in the spring of 2011, so our graph starts off with people knowing about Modern as a format. 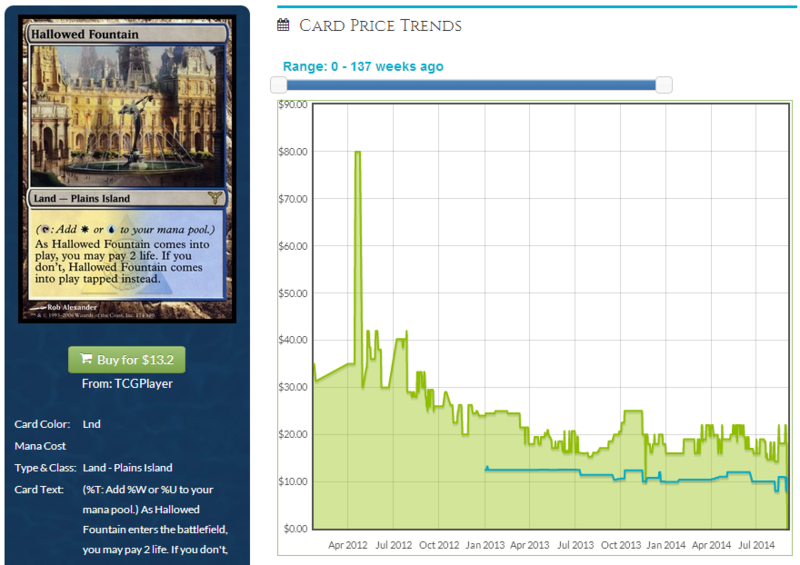 Thoughtseize was in the $30-$40 range at the time. 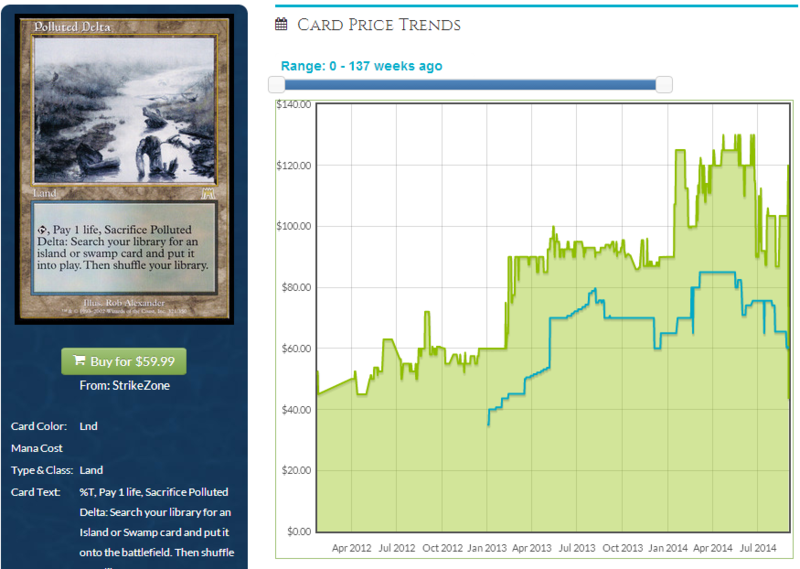 At the start of the PTQ season it skyrocketed towards $60, and lived at $60-$70 until Theros released. It slowly dropped back to it’s pre-PTQ price of $30-$35, which is where it is today. The reprint clearly had an affect on the price of the card, although you’ll notice that the price today is not really much lower than the price of it before it saw a massive spike thanks to a PTQ season. Hallowed Fountain didn’t fare quite so well. It was floating around $30 at the start of 2012, which is right about when we would have gotten the announcement that the fall set that year would be Return to Ravnica. Shocks would have been clearly evident at that point. You see a slow decline starting around the fall of ‘12, and they’ve since leveled off to around $15 or so. The behavior of the rest of the shocks is mostly similar, although Hallowed Fountain and Watery Grave seem to have gotten the worst of it. The original printings of Temple Garden and Stomping Ground have lost only maybe $5, and Sacred Foundry doesn’t appear to have moved at all. It seems that the inflated blue shocks (Fountain, Grave, Breeding Pool, Steam Vents) lost the most, but the non-blue shocks didn’t see more than maybe a 40% loss. Let’s analyze our data a bit at this point. When Thoughtseize was reprinted it was cut in half from its current value, but that doesn’t tell the whole story. With a longer timeline in view, it would be incomplete to say that it was simply a case of the card losing half it’s value. A more accurate description would be that the reprint reversed the doubling of the price the card had seen about a year earlier. I think it would be safe to say that while Thoughtseize being reprinted certainly didn’t help the price, at the end of the day it didn’t really have that much of an impact on the original copy. Here’s another way to consider the price change. The original copy of Thoughtseize has a variety of types of demand. There’s the demand from people that want the first printing, demand from people that think the old art looked better, demand from PTQ grinders, etc. There’s a quantitative amount of demand and it can be segmented into types. When the reprint occurred all the excess PTQ grinder demand was chopped off. The card lost all that extra ‘fat’ demand it had acquired from people that just needed to cast it competitively. It still retained all of it’s other demand. The doubling from $30 to $60 was all competitive demand. The rest of the price was legitimate, sustainable desire for the Lorwyn copy. Hallowed Fountain behaved a bit differently. The price on Dissension copies today is about twice the RTR copy, so clearly there’s still some amount of demand for the first printing. That doesn’t mean it didn’t take a beating when the reprint hit. While it was $30+ ahead of RTR, it’s now only about $15. This would be pretty damning for the Onslaught fetches as a whole if we didn’t consider the other shocks as well. The non-blue shocks lost between zero and forty percent or so, which is not too severe a loss when you consider how many extra copies hit the market in RTR. Thoughtseize and the Shocklands indicate that Onslaught copies will take a loss, but we aren’t quite sure how much. Let’s take a look at the price graph of the most expensive of the five, Polluted Delta. That is some pretty wild growth. We see the price more than double from the spring of ‘12 to early this summer, and it’s still holding a solid $80 even after losing a chunk in the last two months. A growth in price like this immediately makes me think of the Thoughtseize jump at the start of the PTQ season. If you drag this graph out another year into the future, what do you think it looks like? Where do you envision it landing? Which price plateau is the “real” one? One thing that split Thoughtseize from the shocks is playability. Of course both were extremely playable in Standard and Modern, but Thoughtseize went beyond that into Legacy and even Vintage. There is additional playability demand for Thoughtseize that didn’t exist for the shocks. That extra layer of competitive demand provided insulation for Thoughtseize’s price that the shocks didn’t get. These new fetches will absolutely behave similarly to Thoughtseize, except even more so. Ally fetches will be required for Standard, Modern, Legacy, Vintage, EDH, and Cube. Really, who doesn’t want them? Greater demand across the board will help the old copies stand up to a brand new batch much better than if they were only a two-format card. Here’s another factor that was in play to an extent when Thoughtseize was reprinted, but not as drastic as it will be now. Have you seen the new fetches? Like, seen what the cards look like? Those…do not look that hot. The Flooded Strand is sort of cute, and the Bloodstained Mire is by talented artist Daarken, but overall I would say these are not visually impressive lands. I’m not alone either. Upon reveal Twitter blew up about their inclusion in Khans, but the first things I was reading beyond “omg fetches!” was “hey these are kind of dumb looking.” Compared to the the original lands there is a stunning difference in appearance. The aesthetic of the old cards is remarkably different from the new copies in a way that neither the shocks nor Thoughtseize experienced. With a distinction in appearance this strong, there will be a real incentive for aesthetic-oriented players to seek out original copies. A real layer of demand is going to exist from this characteristic alone. I’m partial to old borders so I’ll of course be using the original ones where I can, but even players that are unbiased may find themselves drawn to the original copies. This type of demand is something that cannot be sated by additional printings. 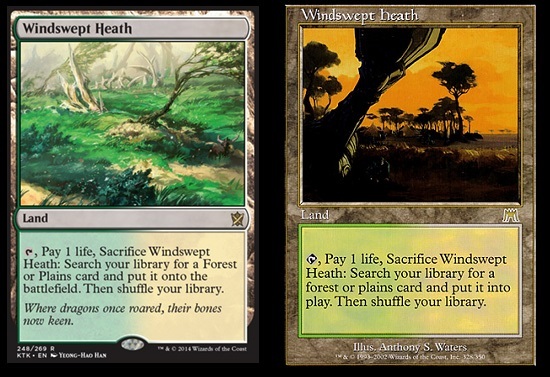 For players such as myself, it doesn’t matter how many times Windswept Heath is printed – I only want to play with the original. We’ve seen it on Thoughtseize with the fairy art, and we’re going to see it even more here. It’s difficult to put a number on this since Wizards doesn’t officially release any of this data, but another quick item to keep in mind is that the original Onslaught fetches were printed less than both the original shocks and the original Thoughtseize, meaning there won’t actually be that many original border copies. Taking everything we know into consideration, what happens with all of our original Onslaught fetches? It seems clear that they’ll be dropping in price, but the question is by how much. I’d hazard a guess that we’ll see Polluted Delta and Flooded Strand land north of $40, but I’m not exactly sure where. I would expect anywhere between $30-$60 to be plausible, and $40-$50 to be a reasonable expectation. The other ones will move, but not by as much. I’d guess that Windswept Heath, Bloodstained Mire, and Wooded Foothills, all about $40 right now, don’t drop below $25 or possibly even $30. These are all educated guesses though, and I’m not promising anything. There may be factors I’m missing or unforeseen changes that will alter these trajectories in ways I can’t predict at the moment. Foil Onslaught copies are only going to rise, not fall. Damnit. What do we do with this? I’m personally holding onto my original copies. Playing with the old border is worth it to me. If you don’t care, I’d look to move them ASAP. Keep the prices in mind that I outlined above, and as long as your trade/sale looks good with that information, go for it. Don’t be afraid to offer a discount on the $80 retail price of Polluted Delta today if it’s going to be $50 in three weeks. If that’s what’s in store for the original copies, how about all the new ones? Well that’s a lot easier to answer. You won’t see in-print rares from a fall set, especially a cycle of five, get too expensive. I’d guess our maximum is about $15 each. If that sounds too low, just do a little math. You average over three of each rare land in a single box. At $20 a piece, three lands would make up well more than half of the value of the box. There’s no way the box prices will support those numbers on rares. I’d say we’ll see prices hover between $7 and $15, with each taking turns at the higher end of that as they see their time to shine in Standard. Bloodstained Mire should consistently be the cheapest one, and Polluted Delta/Flooded Strand will pretty consistently be near the most expensive. The Zendikar fetches averaged maybe $10 each while they were in Standard, so that sounds like a comfortable place for these to live. The best time to get the fetches will be a month or two after release, just like with most rares. There will be an extended period of increased demand as Modern and Legacy players seek to fill out their sets but by the time we hit Christmas that should quiet. They’ll probably be cheapest sometime next year, but nobody wants to wait that long. Feel free to start grabbing your non-foil copies around October if you’re impatient, and December if you can wait. If you’re looking to score foil copies, the best time to buy is also easy. It’s now. 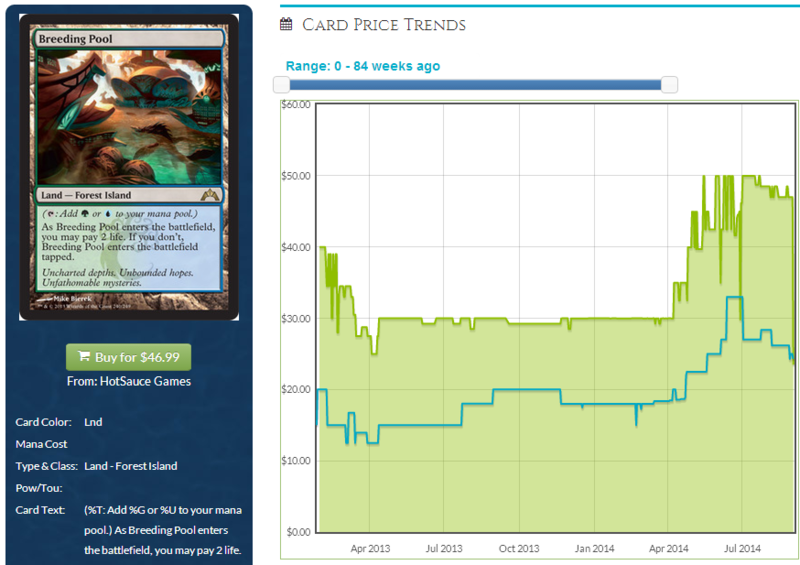 Take a look at the price graph for foil Breeding Pool. Trends for the other shocks are comparable. The foil copies tend to be lowest immediately after release and see very slow to no movement for a few months before they finally start to creep up. I’d say that grabbing foil copies ahead of Christmas would be your best bet. They’ll probably be rather expensive, but that’s the nature of a cycle like this. People will want foil copies for their Cubes, EDH, and Legacy decks. Now that we’ve covered the Onslaught fetches pretty thoroughly, let’s turn our attention to the other five: the Zendikar fetches. What does this reprint mean for them? Well it’s not great, that’s for sure. Currently the Zendikar fetches are as expensive as they are because not only do they have that playable demand from nearly every format, they’re also the only fetches legal in Modern, the largest format that fetches are played in. Way more players are taking one in Modern than Legacy these days and there’s currently only five ways to do it. Adding the ally fetches is going to double the number of choices for Modern players. There will still be plenty of places you want the enemy fetches over the ally fetches. Any three-color deck is going to be in the market for at least a set of enemy fetches still, and possibly two sets if it’s a wedge rather than a shard. Still, no longer being the only game in town is just going to be too hard for them to weather in the near future. Consider the enemy fetches in the same way that I presented Thoughtseize earlier. There’s an existing layer of demand ‘fat’ from being the only legal fetches. While there’s still other types of demand that will help keep the price up, that entire chunk of demand is about to be excised. One thing going for the Zen fetches is that their supply will still be limited. While the ally fetches are going to flood the market, there aren’t any more Misty Rainforests now than there were six months ago. Less people will need them, but those that do need them will still be in the market for them. While many will make do with the inexpensive ally fetches from Khans, plenty of players will continue to insist on having exactly the right ones for the deck. We may see a small surge in the number of players looking for enemy fetches as well. Up until now, people have put off Modern because the mana was too expensive and they didn’t want to deal with it. With shocks readily available and a fetch reprint only a few weeks away, the format suddenly looks wildly more accessible. Once these players start jumping into Modern they will inevitably start looking to fill out their fetch collection with the enemy copies, even if it is only just one or two for a specific deck. The long and short of it is that even though it isn’t all doom and gloom for the Zendikar fetches, it’s still a bad time for them. If you have extra copies (like I do), I wouldn’t hesitate to move them if the prices stay somewhat stable over the next few weeks. If you can get reasonable offers for them now, take it. However if there’s a huge market crash and they lose 60% of their value, don’t sell. It’s not uncommon for the market to overreact to this type of news, and the devalued cards often quickly rebound as players start snatching up now under-valued copies. In the case of a crash, hang on and wait it out until after prices rebound a bit. Watch buylists to see how vendors are reacting; that will give you an idea of how the market is handling the news. 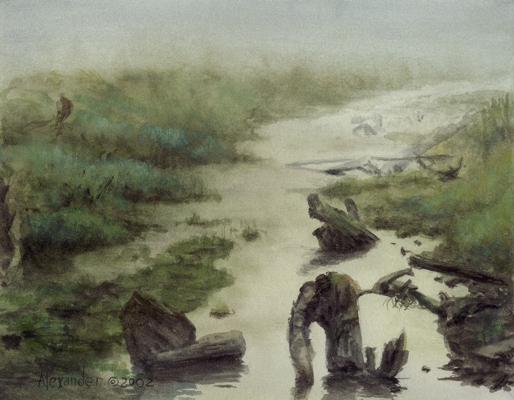 Today, September second, Misty Rainforest is still getting $40 and Scalding Tarn $45. Those aren’t any lower than they were a week ago. With this news, when is the next time we’ll actually see Zendikar fetches? I hear some people talking about seeing them later in the block, but that sounds rather silly to me. With their printing, the mana will be even across enemy and ally pairs. There’s all ten Scrylands, five enemy Painlands, and now five ally Fetchlands. Adding more fetches would push the balance back towards enemy pairs. Assuming there’s a Modern Masters 2, which we are operating assuming that there is, they’re a good choice for that release now. I’ve claimed before that I didn’t think we’d see Zen fetches in MM2, but that was before the ally fetches were in Khans. With the Khans reprint, it takes a lot of pressure off Zen fetches, which means Wizards isn’t in a situation where they need to flood the market with more copies. A more limited release via MM2 would be perfectly acceptable. If we don’t see them there, then I’d say any fall set after Khans is conceivable. It’s hard to say for sure until we get closer. For right now assume an MM2 release is possible/probable, and if they’re not there, then who knows. One more topic I’m seeing discussed a lot – what does the printing of the ally fetches do to Modern? Their appearance will likely see a surge in the overall index of the format. 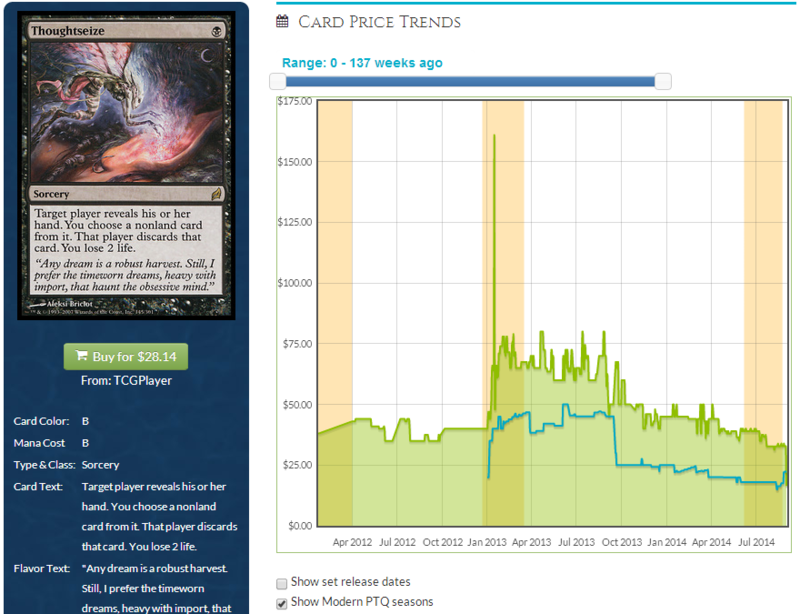 When format staples drop in price due to an event like this, currently under-priced cards tend to jump. Cards like Leonin Arbiter had trouble climbing in the past because the barrier to entry on mana was so high. Nobody wants to shell out for Arbiters if they spent a fortune getting the mana together. Once the mana is accessible more people start buying Arbiters, and the price begins to rise. As a result of the mana getting cheaper, the rest of the deck corrects in response. We’re also going to see a flood of new players enter Modern now that they’ve got both cheap shocks and fetches, which is going to put a greater demand on the already constrained copies of many format staples such as Clique, Spellskite, Goyf, Celestial Colonnade, Snapcaster, etc etc. This is probably the biggest impact the fetches will have on Modern (and Legacy, to a lesser extent). Players that have been priced out of the format up until now are suddenly going to be capable of diving in. Add in that Modern will be playable at PreTQs year round and you’ve got a recipe for price jumps across the board. Beyond that I don’t see the addition of the fetches doing much specifically. The mana in Modern is already so good I can’t imagine these suddenly opening the floodgates for decks previously unplayable. It’s not like there’s some list out there that’s just waiting to become a tier one contender that has only been held back by the lack of Wooded Foothills in the format. Some matchups will change by a few percentage points in certain situations, and Blood Moons may become marginally less effective in a few places as fetching basics gets easier, but overall I don’t see sweeping changes to the format. What’s more likely is that many tier two decks (and worse) become over-represented as people assemble affordable mana bases without actually having the rest of the deck. Sure you can build any mana you want with your RTR shocks and your KTK fetches, but you’re still going to have to cast something with them. Players that don’t feel like shelling out for Liliana of the Veil may find themselves playing all sorts of more off-the-wall brews that could put additional demand on cards currently in the fringe. Those are probably the types of cards that in terms of percentage of growth do the best as a result of all of this. There you have it. In short, the original Onslaught fetches will drop but they won’t crater. Foils will go up. New copies won’t be more than $10-!15. Zendikar fetches will drop. Don’t expect any new Modern decks, but the general Modern index will rise. ADVERTISEMENT: Tired of overpaying for card sleeves for your decks? CheapCardSleeves offers discounted prices and bulk packages on popular brands of sleeves including Ultra Pro, Dragon Shield, KMC, and more! Bulk orders of cheap card sleeves include free shipping to the US and they also offer flat-rate shipping for smaller and international orders. Next time you’re building a new deck, or a cube, save yourself money and get your magic sleeves from CheapCardSleeves! Enjoy even further discounts with their “End of Summer Sale” that is currently ongoing! I hear some people talking about seeing them later in the block, but that sounds rather silly to me. It’s not some people, it’s quite a lot of them. That’s mainly because Mark Rosewater went on and on and on about how every block was going to have the full set of 10 two-colour lands. He said that this year and most really don’t believe that he’d say that knowing “Louie” didn’t have Zendikar fetch reprints. Or you can avoid learning from this and keep believing there’s no reprint coming in six months. I don’t remember ever reading Mark talking about block was going to have the full set of 10 duals. The only person talking about that topic was Sam Stoddard when: 1) revealing that m14 doesn’t have any duals, stating that they want every color-combination to have access to the same amount of duals. 2) revealing the M15 painlands, he clearly stated, that 1) is still valid, but doesn’t mean all combinations get the same type of lands, wich indicated the allied duals not being painlands. I personally don’t believe in a zendikar-fetch-reprint in louie. 1. ‘What doesn’t help delve?’ Jee, I don’t know maybe non-fetch duals? 2. ‘I’m guessing they weren’t originally planned for the block.’ The were the first cards in the file according to the set’s lead designer. 3. ‘I hear some people talking about seeing them later in the block, but that sounds rather silly to me.’ Zendikar fetch lands are more likely than not to be printed in the third set. To the people reading this blog I’d suggest treating it as a source of Level 1 information (which can be vary useful, like the price history on Thoughtseize and others) but taking the rest with a grain of salt. I’ll have to treat the above comment as level 0 information as the user can’t be bothered to spell “very” correctly. Sure, comment on the spelling rather than content, how civilized of you. It’s a weak argument that allied fetches are “out of place” because they don’t line up with Khans wedges. They obviously don’t want you to have perfect mana by running 8 fetches. They did the same thing in Shards of Alara / Zendikar standard. The fetches don’t line up perfectly with the shards. I agree with you: it feels like the Fetchlands are parachuted in. Yeap to be honest it looks kinda weird, it is the first set of the fall and we already have a manabase similar to Zendikar/Alara. Interesting article, but I take a mild issue with your comment, “Those…do not look that hot. ” You comment that the older fetches look better almost as if you were stating a fact. This is in fact very much an opinion. Perhaps most will agree with this, but undoubtedly there will be a set of people (myself included) who find the newer artwork more appealing. Yes, the older style is visually different and will appeal more to some, but it remains yet to be seen which artwork is truly appreciated more. I happen to like both sets, but it will be much easier to obtain the new ones, and I think many will feel the same. Yeah, but note his choice in words (think, might). It would also be weird to start a set’s development with 5 Fetchlands. It might not be the case, but they certainly feel parachuted in. Not even development but design and no it wouldn’t be weird. Knowing what dual lands are in the set let’s you focus on making cards that interact with them, like the delve mechanic. And if you feel like Mark would say something like that about cards that were ‘parachuted in’, it’s like you presume he’s lying about it. Saying they were emergency put in the set is illogical and means you’re somewhat ignorant of the facts. Did you know Innistrad lands were the cycle first meant to be printed in M15? Out of all the appearances of check lands (M10, M11, M12, M13, INN) only the M12 printing interacted with duals with basic land types (which fetch lands are) for less than 12 months. So what was the reason to put Innistrad lands in the file? Probably not the 3 months of shock lands. It must’ve been the fetch lands which means fetch lands had been locked in for Khans before M15’s development was completed. Were you there when Wizard’s lied to the fans about Coldsnap? I am finding it quite strange that you are so quick to dismiss the possibility of enemy fetchlands in the third set of Khans after being so completely blindsided by allied fetches in Khans itself. Note that many of us weren’t caught off guard specifically because we were not willing to shut the door on the possibility and look at the evidence available. 1. Modern Masters 2 is not a known quantity, nor would it be appropriate to print Fetchlands in them. Certainly MM2 in the next year is possible, but it does a great disservice to everyone to spout off that it is a certainty at this point. We don’t know. The reasons that fetchlands are not appropriate for them should be abundantly clear right now: Wizards is willing to place them in Standard legal sets, and Modern Masters products in the future will likely follow the same strong draft format. Rare duals are particularly poor for drafting, as they come up far too rarely to meaningfully provide mana fixing in limited play. These two reasons should be sufficient enough to pretty much exclude fetchlands, and any rare mana fixing cycle with rare exceptions, from the sets in the future. 2. The argument that an imbalance of color fixing is rather flawed given that Khans block will be the first forray into the next standard rotation schedule. This is extremely relevant, as we could see the same sort of split that we saw with M15-Khans, in that the third set may have Zendikar lands and M16 has allied painlands. Why is this important? Because Khans and the second set will rotate out, with Fate Reforged and M16 forming a pseudo-block that will rotate out at a different time. The easy fix for an imbalance that might occur is to look at what they did to “fix” the imbalance that would have occurred previously, and that is entirely a possibility for Fate Reforged and M16. Enemy Fetches and Allied Painlands. 3. Considering that we are going to enter a “growing pain” period of the new standard rotation schedule, something interesting will arise if no dual land cycle exists in Fate Reforged-M16 pseudo block, and that is that there will be a dearth of mana fixing one Khans-Dewey rotates in likely early 2016. At *best* we will have a full cycle of whatever lands appear in Blood&Sweat, with a partial cycle in Tears. And that’s assuming they decide on full sets in a split between Large-Small, which is not a guarantee. A pseudo cycle in the pseudo-block of Fate Reforged-M16 allows a stable mana base as we enter the first transitionary period, and minimizes what could easily be a chaotic mess. 4. Thematically, we know some information on what Khans block’s story will generally be. There is time travel, likely involving Sarkhan, and it isn’t a difficult assumption to make that the third set may be a time-altered version of Tarkir with the affects of Sarkhan’s traveling altering the present plane. Enemy fetchlands could make sense thematically here, as they would to a degree represent how alterations have occurred and the flux the plane has gone through. Of course, this is speculation, but given what we know it isn’t unreasonable speculation. Further, if they were to reprint fetchlands in Fate Reforged, I get practically guarantee allied painlands to compensate in M16. 5. If I am right on Fetches-Painlands coming up, it creates an interesting dynamic for the latter part of this final 2-block standard. Fetchlands are quite strong in both aggressive and slower strategies. Painlands are much better in aggressive strategies, and scrylands stronger in slower strategies. The mana bases would be affectively equal for all archetypes for quite possibly the first time in recent memory. Slow decks would run Fetches and Scrylands, fast would run Painlands and Fetches. This is all to point out some lines of logic that can certainly indicate that fetchlands are possible for Fate Reforged; there is no good reason to dismiss them as an impossibility, and even less reason to assume that they will be in MM2- which is based on almost completely unfounded assumptions that MM2 will happen next year. I won’t be surprised if it comes about;, but it is hardly certainty and I would not be surprised at all if it didn’t. I am almost certain that fetchlands will not be present, however. There are issues with all 10 fetchlands in the same standard for any significant time, however. Constant shuffling being the most important. I think it would be muted however considering that they seem to specifically have designed Khans to interact as lightly as possible with fetches (They are, however, probably the best duals available for aggressive minded wedges for reasons I won’t get into right now). On my previous post I incorrectly labeled the third set as Fate Reforged. Khans-Fate Reforged will be within the same rotation, with Louie-M16 rotating out later. Implications remain the same, however. See the spoilers! Ugin’s Nexus and Ghostfire Blade. Ugin and colorless creatures (like Eldrazi…) are themes very very super related to the storyline of the Zendikar block. If you see the signs, sell/trade your zendikar fetches when you can. If you don’t wanna see the signs, keep them and rationalize your way to the next spring spoilers season. While I tend to agree with a 3d set of khans switching to Zendikar plan (that would be the thing announced that “WotC never did before”), the sole signs of Ugin stuff being in Khans is not enough, the same way the “souls of Innistrad” in M15 had no meaning on the come back to the Innistrad plane. And i would wait to fire sell my zen fetches for now… it’s too late as they took a big hit. And too soon as they will probably recover until Zen fetches are announced in the 3d set (which is my strong belief). The total glance of your web site is wonderful, as smartly as the content! i am genuinely impressed to read everthing at alone place.